It is February and buds of many trees are starting to push already here in California. 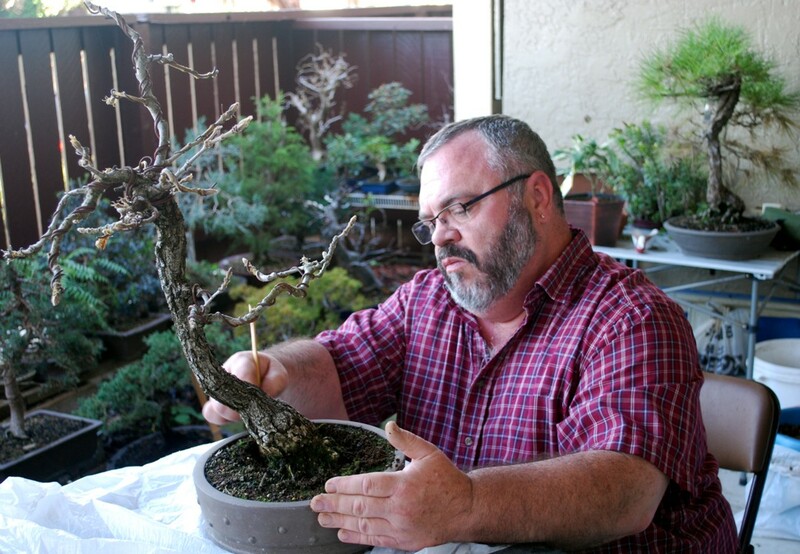 Roots are moving and buds pushing so that means it is time to re-pot many trees. 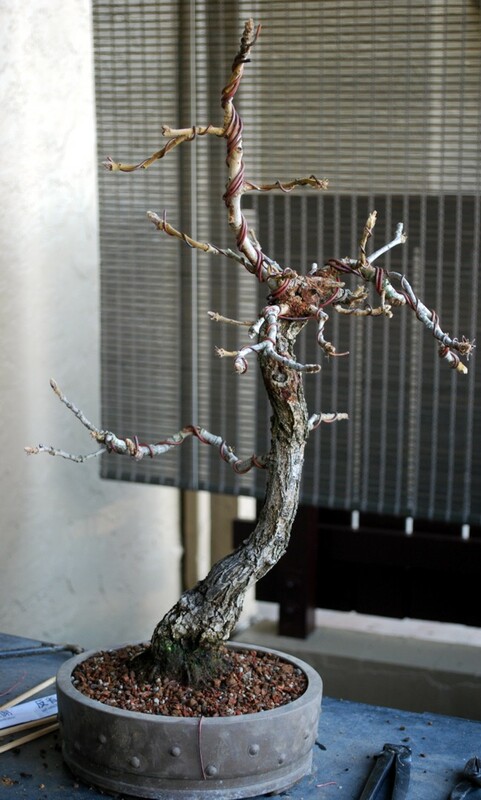 The Diamyo Oak is a prize in the collection and is over 55 years old. It was last re-potted 5 years ago in the round drum pot. 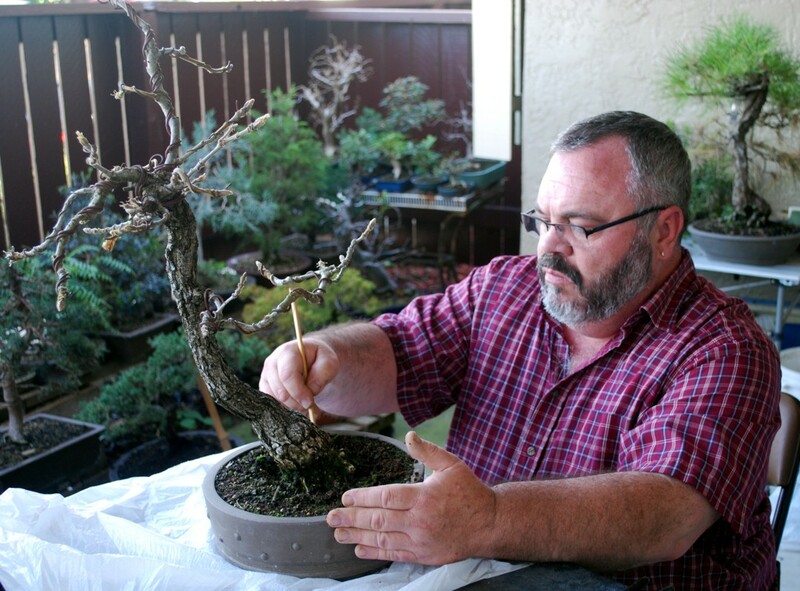 My sensei has worked with me to restyle to tree last year and indicated that the orientation of the tree in the pot needed to change for the new apex and to highlight the movement in the trunk. 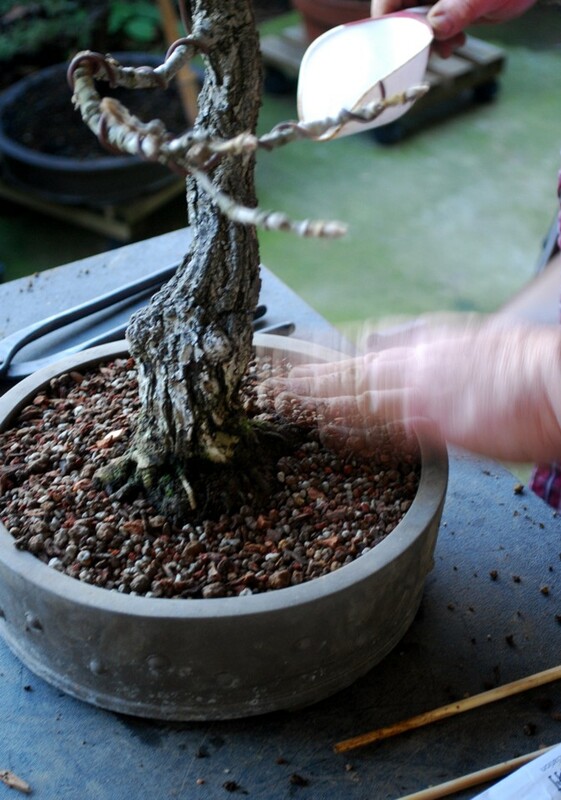 Watch in the pictures how the process is done and the new position in the pot. 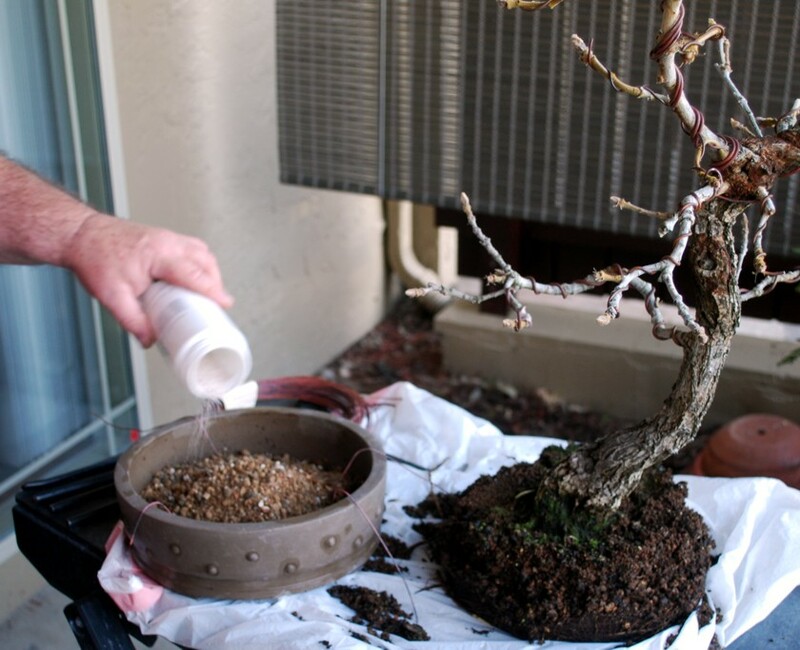 Nebari of the oak is being cleaned to remove any moss or mud from around the root base. The clean up is essential for preparation. I need to make sure all the weeds and much of the old soil is removed from the root crown. This a formal shot of the original front. The tree leaned far to one side to allow the leaf canopy to hang over that direction. 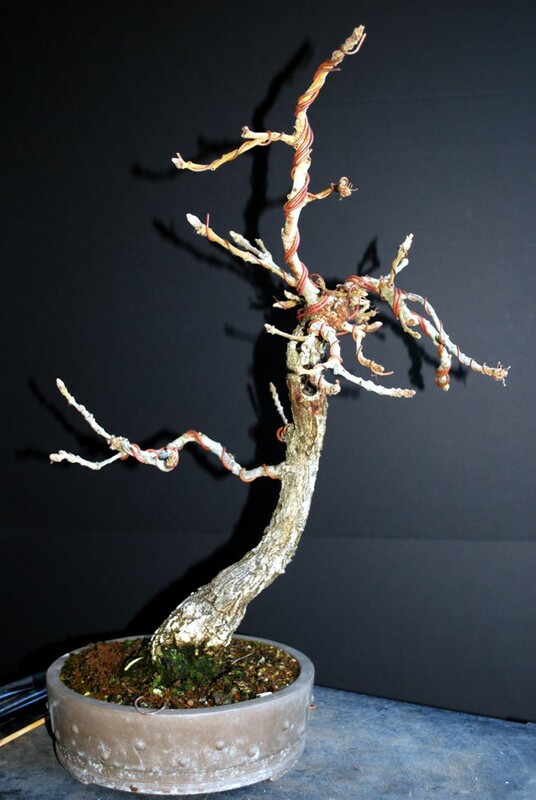 The new apex is the branch leading upward and is a considerable redesign of the tree. 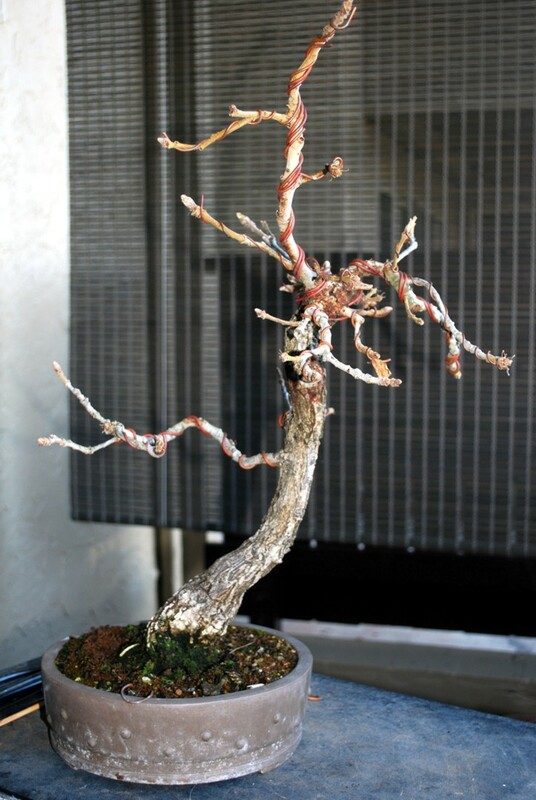 Original front and angle before potting. Next step was to use the edger to loosen the soil and roots from the pot edge. The Tie-in wires and screen wire have been cut from the bottom of the pot as well as any visible wires on the top of the soil. Pot prep is essential to get done before root work is started. This will lessen the time the roots are in the air and drying. Prepare pot with screen, tie-wires and drainage layer. I then add soil amendments like this microryza fungi which will support root growth. The oak is out of the pot and there is a good root mass under the tree. 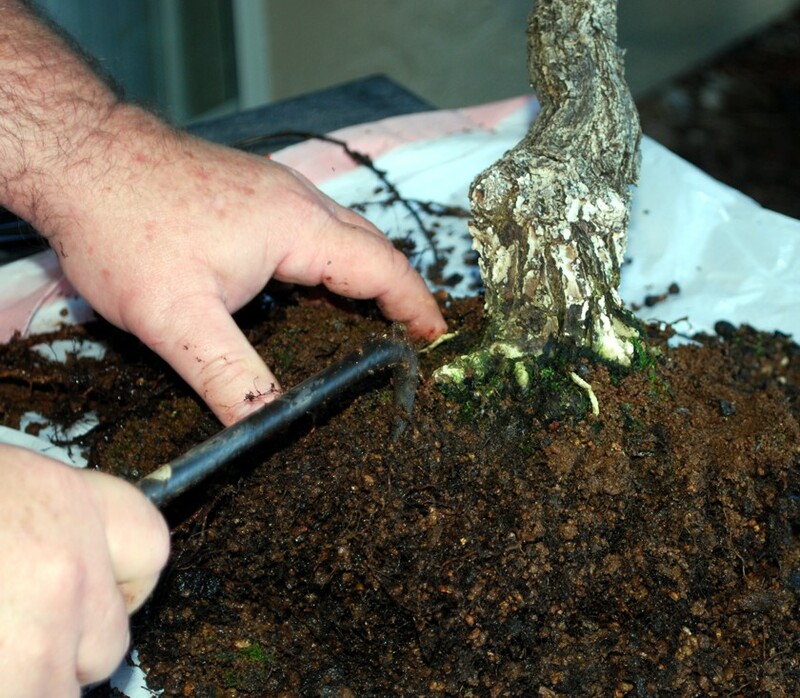 Soil removal begins with loosing the root mass and clearing soil from under the trunk. Once the bottom is moving then we begin on the top soil. 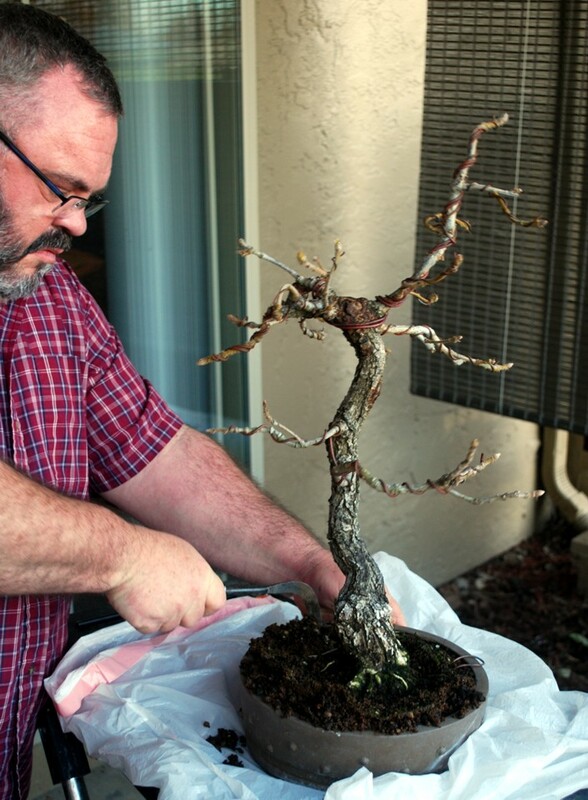 With a root hook I begin working on removing soil from the top the tree taking time to free roots and loosen hardened soil areas. 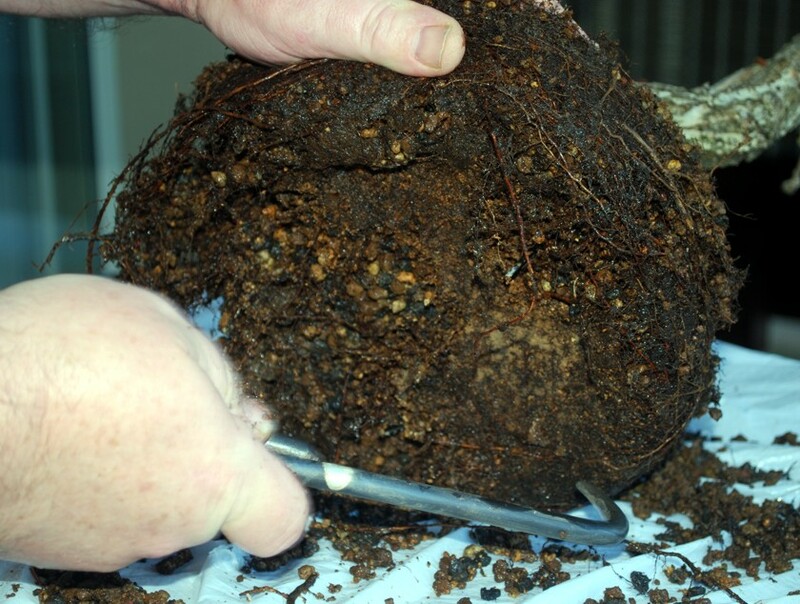 Inspect roots carefully, removing rot and heavy roots to allow new root development. I cut off excess roots and clean the root ball. 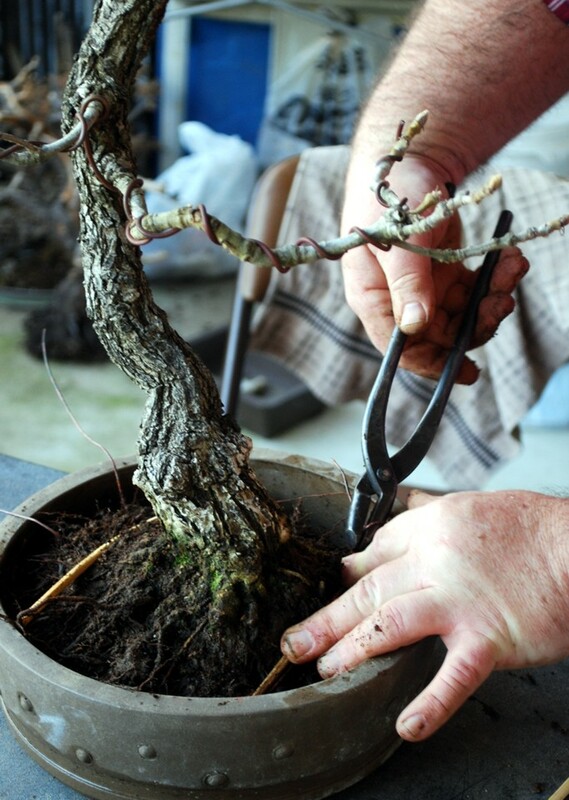 Barer rooting is not done but at each re-potting I remove more and more of the old material. Now the hard part. 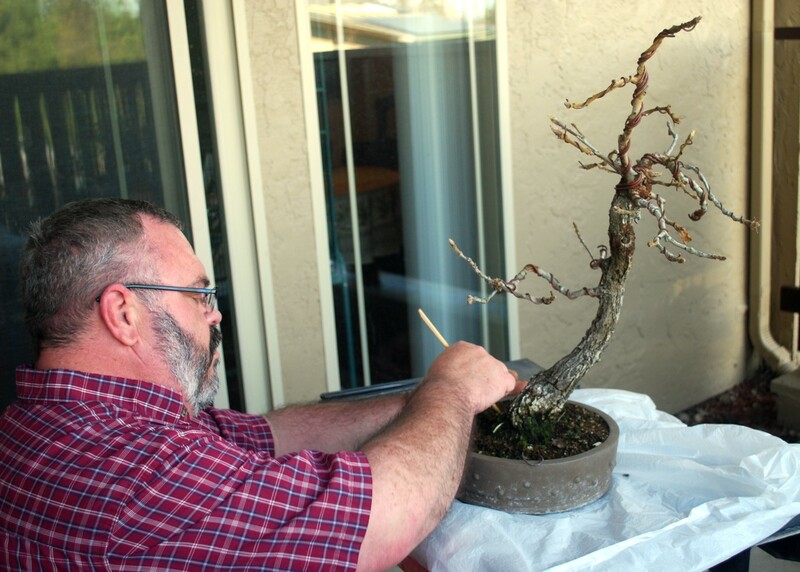 Placing the tree in the pot with the new front and orientation. 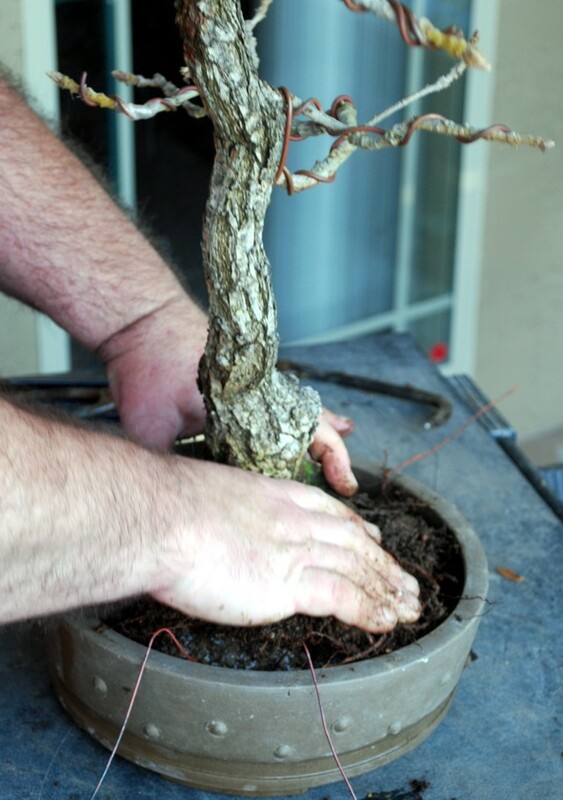 Before wiring in, I place the tree, make sure it is positioned correctly between the feet of the pot and the trunk is at desired angle. 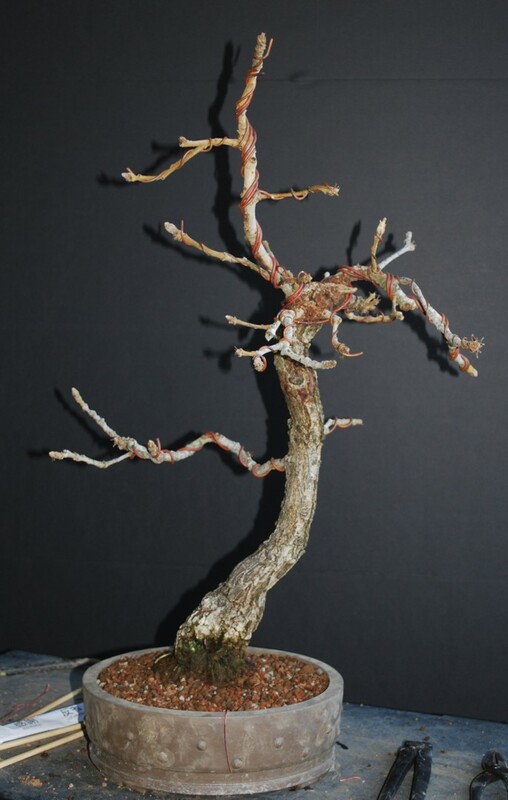 Once this is done I place chopsticks over the root mass to protect the from the wire. Chops are in and tie-in begins. I find this a problematic time because the tree may slip and the angle change so I an constantly looking to be sure the orientation is maintained. Tree is tied in and the soil is added. 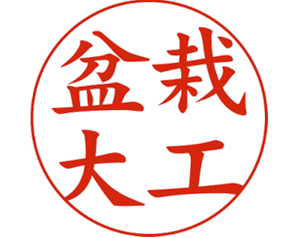 I first chop stick in the soil to remove any air pockets. This is done around the entire tree and more soil is added to finally the height desired. I am patting the soil down from the top to ensure it settles well. Newly re-potted at new angle. It shows the movement of the trunk and positions the apex. Newly re-potted at new angle. It shows the movement of the trunk and positions the apex. This is the formal shot. Next is to water in the tree and let it grow. The leaf buts are looking good and I expect to have good development in the next few weeks. Good tip about the chopsticks protecting the surface roots. Thanks for the post.